Philco began in 1892 as a moderately successful manufacturer of carbon arc lamps. In 1906 the company reorganized into the Philadelphia Storage Battery Company with eighteen employees and began to turn a profit. In 1919 the familiar Philco trademark was introduced on a new line of batteries know as Diamond Grid with sales in excessive of four million dollars annually. This product line lead the company into the production of an emerging technology called Radio and by 1930 was hugely successful mainly due to the Baby Grand Model 20 that was relatively affordable. Though 49.50 (less tubes) was a significant amount for the Depression Era the price was affordable to most. This was a strategic difference between Philco and its competitors who concentrated on the higher priced console market. 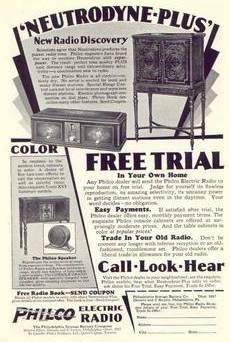 By 1931 Philco was the leading seller of radios and maintained electronics dominance through the Second World War. Philco engineered many innovations and changed the face of electronics for all time. Today the Philco name, as a subsidiary of the Philips Electronics conglomerate, can be found on value priced electronics mostly in mass retail. Philco is an archetypical American success story. It faced adversity many times but through foresight, innovation, and diligence became ingrained in Americana forever. But the Philcos of the 30s, the romance and beauty of those fabulous wood cathedrals, are the real attraction for me. There is great personal satisfaction in rescuing and preserving a part of our history! The history of this hobby surely began in the 1920s with the first curious person who just had to see what made those tubes glow. The depth of the hobby is quite surprising. There are numerous WEB resources for procuring radios, parts, technical specifications, reference materials, and even vintage test equipment. Also, as my RELATED LINKS page presents, a wealth of technical and advisory resources are available to share and help! Please allow a quick philosophical note. I do not REFINISH or REPAIR these old sets. I attempt to RESTORE them. I seldom do anything that cannot be undone. RESTORATION involves preserving the appearance of the old electrical components by hiding new components inside the old shell, use of authentic lacquer finishes when cabinet restoration is necessary, use of ACTUAL components, grille cloth, knobs, etc. when replacement is needed. In brief, the objective is to return a set to safe operation while leaving the appearance close to a well-maintained seventy-year-old artifact.